Elaine Comparone, harpsichord, performs with Daniel Waitzman, recorders and transverse flute, and Henry Schuman, oboe, at WBAI's Free Music Store on November 11, 1971. The trio performs Sonata in G minor for flute and harpsichord, BWV 1020 by C.P.E. Bach, Sonata no. 1 in A minor by C.P.E. Bach, Sonata for recorder and continuo by Georg Philip Telemann. Barbara Oka announces intermission. The ensemble then plays Trio sonata in C minor by Johann Joachim Quantz, Sonata brillante for solo recorder by Anton Heberle, and five harpsichord sonatas by Domenico Scarlatti. This recording was formerly cataloged as BC0709.03A. Tape distortion at 00:02:37. 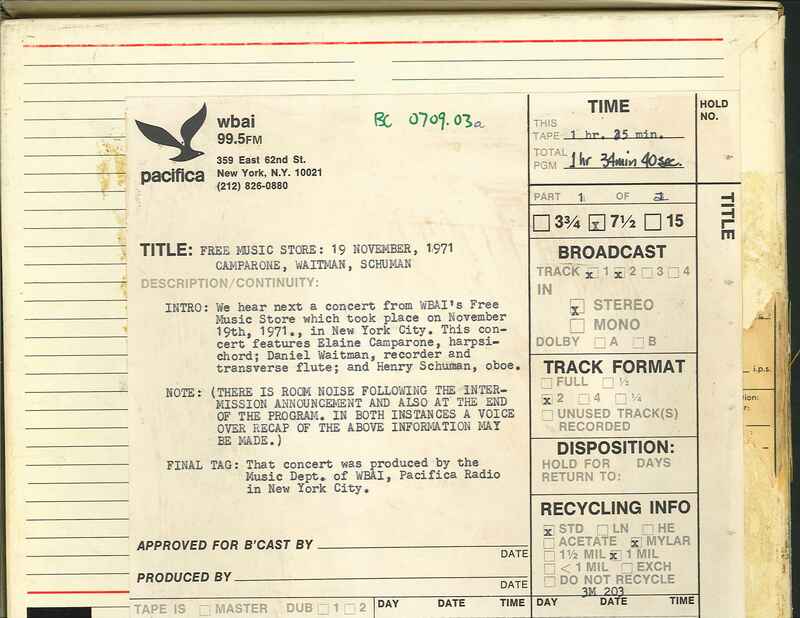 Los Angeles, Pacifica Radio Archives, 1971.